Although Honda has previously used the City name on a subcompact hatchback in the 80s and early 90s, the lineage of the current Honda City sedan can be traced back to the first sedan model which made its local debut in the late 90s. The 4-door City was developed mainly for Southeast Asia, it was a smaller, simpler and more affordable alternative to the Honda Civic sedan which by then already moved upmarket. In 2003, the tall Jazz-based City sedan was introduced; it inherited its hatchback s siblings versatile interior. In early 2009, the third iteration of the City sedan landed on our shores, it was now sleeker and sportier than its predecessor. In 2014 Honda Philippines finally introduced the current generation City sedan. 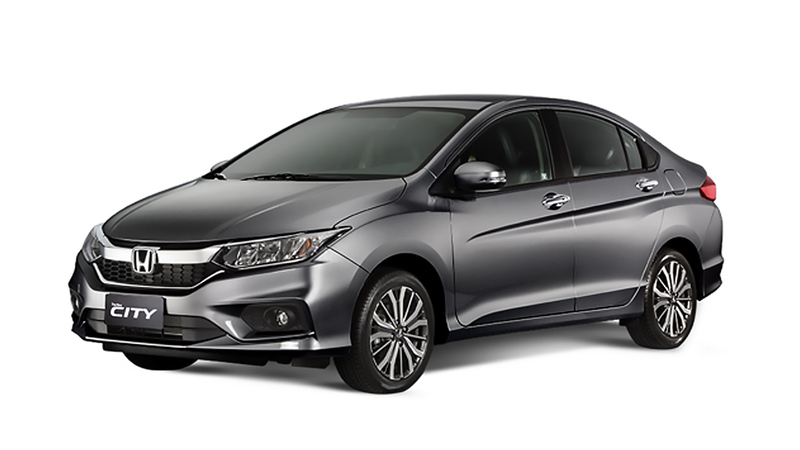 Like its Jazz sibling, the current Honda City adopts the Japanese carmaker s Exciting H Design language which features a more fluid silhouette that s more dynamic and refined. The front is dominated by the brand s wing face grille design which was updated to resemble the one on the latest Civic. Its sleek headlights have been restyled with integrated LED daytime running lights. Range topping models have full LED headlight units. Moving on to the side, it has a prominent curved front fender line and a pronounced character line. The rear gets horizontal taillights linked by a chrome bar. At the back, its redesigned rear bumpers now sport faux honeycomb inserts that mirror the grille pattern. Inside it has a driver-oriented dashboard reminiscent of the one on the Jazz. Its instrument cluster houses a speedometer flanked by a tachometer and a fuel gauge, higher variants get a larger info display, a range computer, and an Eco Ambient Light Meter which guides the driver in getting the best fuel mileage. Middle and High variants get a seven-inch touch screen; the VX and VX+ get Navigation as standard. The current Honda City s platform is based on the updated one that underpins the current Jazz hatchback. Compared to the previous generation, the current model s wheelbase has been stretched to 2600mm; a 50mm increase over the model it replaces. Interior space, particularly the rear passenger area has been improved. Suspension remains the same, independent MacPherson struts up front and the compact torsion beam at the rear. Front and rear stabilizer bars are standard on all variants. Its steering is rack and pinion with electric power assist. Like before, the lone engine offering in the current Honda City is the trusty 1.5-liter SOHC 16-valve i-VTEC gasoline mill which produces 118hp and 145Nm of torque. This motor can be mated to either a 5-speed manual transmission (base E trim) or a continuously variable transmission. The VX Navi and VX+ Navi variants feature paddle shifters. All variants of the Honda City come with a host of standard safety features which include dual-airbags, anti-lock braking system with electronic brakeforce distribution, three-point seatbelts for all five occupants, and ISOFIX child seat anchors. The range-topping VX+ Navi variant gets additional safety equipment like side airbags, curtain airbags, vehicle stability control, and hill start assist.